SRMC Chief Executive Officer Bernard Wheatley testifies before the Senate Finance Committee. 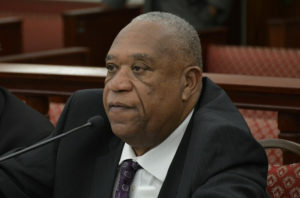 A slashed budget, a recently instituted minimum-wage increase, post-hurricane revenue drop, and the cost of uncompensated care are straining the Schneider Regional Medical Center’s budget, SRMC Chief Executive Officer Bernard Wheatley told lawmakers Thursday. Wheatley, accompanied by his team of heads of departments at SRMC, was defending the hospital’s budget before the Senate Finance Committee. This year, the hospital has a recommended budget of $23.8 million, which will cause a $4.5 million shortfall for the hospital, according to Wheatley, once expenses are taken into account. The declining government allotments are erasing much of the gains the hospital made in recent years, he said. From fiscal years 2015 through 2017, SRMC’s patient revenues have gone up 12 percent – from $49.4 million to $55.1 million – even taking into account reduced revenues beginning September 2017, in which month the hospital lost about $3.3 million. The hospital also experienced a 13 percent decrease in expenses, and its operational losses even dropped 40 percent during the same three-year period, according to Wheatley. These gains, however, were offset by a nine percent reduction in government allotments, said Wheatley, which dropped by $22.5 million to $20.4 million. The hospital’s revenues also suffered significantly after the storms, said Wheatley. Comparing the first nine months of fiscal year 2018, right up to Hurricanes Irma and Maria, Wheatley said total inpatient days have decreased by 47 percent, inpatient surgeries have decreased by 29 percent, outpatient surgeries have decreased by 47 percent, emergency room visits by 19 percent and total outpatient registrations by 41 percent. Gov. Kenneth Mapp’s recent executive order to increase the minimum salary for executive branch employees to $13 an hour – $27,040 annually – will also increase SRMC’s personnel costs by approximately $475,000 per year to cover some 103 affected employees. The hospital will depend on more appropriations to fund and maintain the increases, said Wheatley, not just for those employees directly affected, but also the more seasoned employees whose salaries should also see a bump due to the new minimum wage. As a result, the hospital is considering a two to three percent raises for all its other employees, excluding executives and physicians, who would not have otherwise received a salary increase. Wheatley estimated countering the salary compression will cost the hospital another $338,000 for some 220 employees. The slight bump also will not represent an incremental on-step increase per the hospital employees’ collective bargaining agreement, but only “a slight cost of living salary adjustment,” according to Wheatley. The hospital still struggles to absorb uncompensated care costs from a large majority of its patients, according to Wheatley. In fiscal year 2017, SRMC absorbed some $9 million in costs from services rendered to uninsured Medicare and Medicaid patients, after local and federal payments. Currently, some 75 percent of its payers consist of Medicare, Medicaid or Medicare patients. To improve the hospital’s collections, it is aggressively encouraging its patients to enroll in the Medicaid program to take advantage of federal reimbursements. In addition, the Office of Management and Budget in February began deducting some $315,000 monthly from the hospital’s government allotments to pay for the facility’s Water and Power Authority obligations. According to Wheatley, this is in spite of the hospital’s attempts to pay for the electric bills, payments that amounted to $627,000 in fiscal year 2018. Wheatley also stressed the hospital’s severe staffing shortage, with approximately 150 vacant clinical positions and 10 vacant positions in non-clinical areas. In order to retain and attract needed staff, approximately 30 entry level employees got salary raises totaling $30,000. A $12,000 raise for registered nurses was also recently announced by the hospital. The Office of Veterans Affairs also presented its budget, some $783,625 for fiscal year 2019. Of that amount, an estimated $335,000 will to toward personnel salaries and fringe benefits, according to Veterans Affairs Director Patrick Farrell. The Office of Veterans Affairs monitors and supports some 8,000 veterans in the territory, allocating roughly $300,000 to cover their medical travel and, if needed, death benefits. Farrell is advocating for paying local funeral homes upfront instead of having veterans’ families pay $8,000 to $10,000 to be reimbursed later by the agency. Farrell said the agency is also researching the feasibility of purchasing plane tickets for veterans traveling off–island, mainly to Puerto Rico, for medical reasons. Having veterans purchase their own tickets and go through bureaucratic red-tape to get reimbursed presents an additional hardship for them, according to Farrell, especially if they have to travel multiple times a month.